Let me be blunt. I think it was a terrible idea to trade away a 22 year-old potential franchise defenseman. If the 5.75M cap hit (what he eventually signed for in Calgary) was a problem, then trade someone else, someone who didn’t have as long or as bright a future. Trading away young franchise players is usually never a good thing unless you are getting a young franchise player in return – just ask Peter Charelli. The Milan Lucic Trade: Don Sweeney then traded away Milan Lucic for the 13th pick in the 2015 draft – Jakub Zboril, Martin Jones, a goaltender (who was flipped to San Jose for a 2016 1st rounder plus Sean Kuraly) and a smallish puck-moving defense prospect, Colin Miller, who had a very good year in the AHL last year. This trade made a lot more sense for me. You have a player who has lost his mojo and was not providing a top six game and you replace him with two 1st round picks and an AHL prospect coming off a decent year. Would I have made the Sweeney picks? No, I wouldn’t have been able to lay-off the potential high-offense of Barzal and Connor or even the strong game of Colin White. For me, Sweeney had the potential to restock the offense for a decade and did not take advantage of that unique opportunity. Zach Senyshyn : Sweeney 15th versus MacKenzie’s 52nd – When you saw Bob McKenzie’s drop at the draft and stutter for words shortly thereafter, you knew that this was a mucho big outlier pick. Although I had Zach at 46, I still think he will be an NHLer and may make Sweeney look like a genius in the long run. We will not know really know how Sweeney did with his picks until 3 to 5 years down the road. We can’t say that Sweeney didn’t give us enough to talk about this summer. 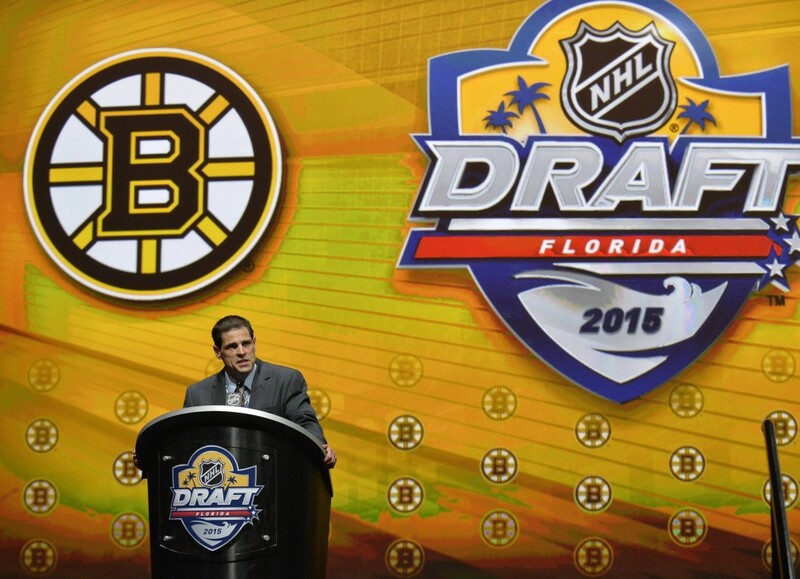 Editor’s Note: Other than Zboril, the first round was perplexing to all outside the Bruins’ organization. The second was another story as Sweeney and crew, on paper at least, got excellent value. MacDonald mentioned Carlo. Forward Jakob Forsbacka-Karlsson (JFK) and blueliner Jeremy Lauzon are talented players in their own right and may have hockey pundits and fans alike reflecting back on this Bruins draft class in a positive light. The top five players on the Bruins Prospect List have a strong chance of making the NHL and having a positive impact on the team when they do. In addition, there will likely some of the others who make the NHL. However, they are either less likely to have an impact or less likely to make the NHL or both. Five impact players is around the average for the NHL. The team with the most impact players is Winnipeg with 9 followed by Arizona and Detroit with 8 apiece. Los Angeles trails with just 1. Jakub Zboril appears to be a safe pick for Boston. I don’t see him as a high-end talent. He does, however, seem to possess the talent and qualities of a solid 3-4 defender, one who plays the PK, is on the PP or, at least, the second unit and has the defensive prowess to be put in the critical 5 on 5 defensive situations such as last minute or against the opposition’s top line. He is close to average size for a defenseman (which is 6’2 in the NHL) and can play physical or clean the crease area. He is also a two-way defensemen in that he has good skating ability and a great shot from the blueline, slapper or wrister. I was able to watch him quite a bit in Saint John last year – he was a player that I liked but he didn’t wow you. That is, solid but not awesome. He will be a welcome addition to the Boston blueline in a few years time. Editor’s Note: Though a small sample size of live viewing, Zboril was impressive in Hockey Canada’s World Junior Summer Showcase, for which he was the best player on the ice for about half the game. Here is what Peter Sullivan of NHL Central Scouting said about him at NHL.com, “His work ethic is off the charts but what also helps are those 42 goals he scored. He’s a 40-goal scorer who does the dirty work in front of the net. His greatest strength is his compete level.” In short, be brings the same type of assets to the table as Brendan Gallagher does for the Montreal Canadiens. The knocks against him have been his slight size and his defense. His defensive game last year, however, had improved considerably so I don’t think it will be a problem in the long run. Malcolm is one of those rare prospects who is both a 1st rounder and a goalie. 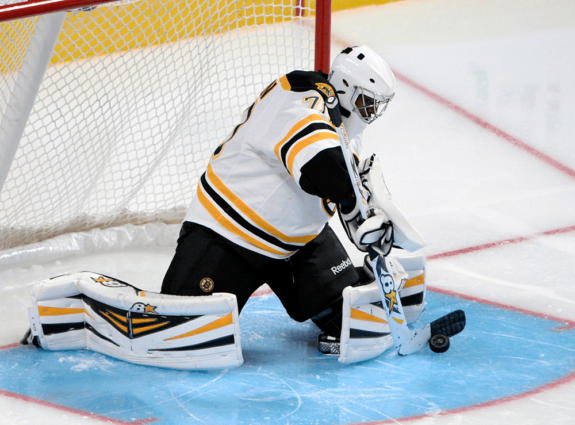 He has played two seasons in the minors where he has been good but not quite good enough to force the Bruins to elevate him to the NHL on a permanent basis. His one game in the NHL was kind of a disaster. Will this be the year that Malcom makes it to the NHL. He will face strong competition from his Providence teammate, Jeremy Smith. Let the competition begin. Yes, I am a big fan of the big-guy. I saw him play for the Team USA U20 at the 2014-15 IIHF U20s where he performed almost as well as two defensemen taken in the top of the NHL draft, Noah Hanifin and Zach Werenski. Who doesn’t love a towering 6’5 defenseman who can skate and has a bit of mean streak? Boston was able to grab him in the second round because his play flat-lined after the U20 tournament and he didn’t show much offense. I am betting the guy that I saw in the U20 tournament shows up this fall and turns into a steal for the Bruins organization. Yes, Zach was chosen in the draft a lot higher than expected. That means nothing; it is what happens from now on that counts. There is no reason Zach Senyshyn can’t become a solid NHLer. Colin Miller had a very good year last year playing for the Kings AHL franchise, Manchester. He not only led the league in goals for a defenseman but he was named to the second all-star team and eventually helped lead Manchester to a Calder Cup win. He showed some major league talent at the AHL All Star game where he excelled in the Skills Competition – winning both hardest shot and fastest skater. The offense is unquestionably major league; the question that is still up in the air is – Will this slightly undersized, slender defenseman be able to move that successful AHL game up to the NHL and stand up to the rigors of the NHL as well as put up an NHL defense. The talent is there; the body is still suspect. Joe Morrow is a former 1st rounder of the Pittsburg Penguins who has already played 3 seasons in the AHL and has had a cup of tea in the NHL, 15 games with Boston last year. Joe was a 1st rounder because of his offense, his booming shot, his skating and puck moving abilities. His defense, however, has always been a little suspect and that has kept him from a permanent job in the NHL. This year he will face strong competition (such as Colin Miller and Zach Trotman) for that last blueline roster spot. Let the competition begin! Here is what I wrote about Ryan Donato here at THW during his draft year, “Elusive skating, velvet hands, elite vision combined with drive, energy and determination. Bottom line – elite scorer. What he lacks in top line speed he makes up for in mobility and agility.” Since I wrote that piece, Ryan has improved his skating significantly. Next year, he will play for Harvard and his dear old Dad, NHL veteran Ted Donato. Here is my favourite quote about Alexander Khokhlachev. It comes from Cam Kerry here at THW, “With hands that are softer than a baby’s bottom, Khokhlachev has the potential to be an offensive wizard in the future. Very dynamic in the offensive zone, he could use work defensively and get bigger so that he can win battles against larger opponents.” After two seasons in the AHL, Alexander is ready to show his stuff in the NHL. The two deficiencies in his game has been size and defense. If he can get the defense to an acceptable level for Coach Claude Julien he will be in the NHL this year for sure. The Bruins Development Coach, Jay Pandolfo told NESN.com at the Bruins development camp, “You can tell he’s talented. He’s got a lot of poise with the puck. He’s got a great release, a great shot. He’s going to be a really good player. He still needs to get a little stronger. That will help him protecting pucks. But he looks really good. I thought he stood out today.” Heinen was third in Division I freshmen in scoring and made the NCHC second all-star team. It looks like the talent is there; the question about Danton is will he add the weight and strength necessary to successfully compete in the NHL. As last year was his rookie year in the NCAA, he will have three more years to get ready.